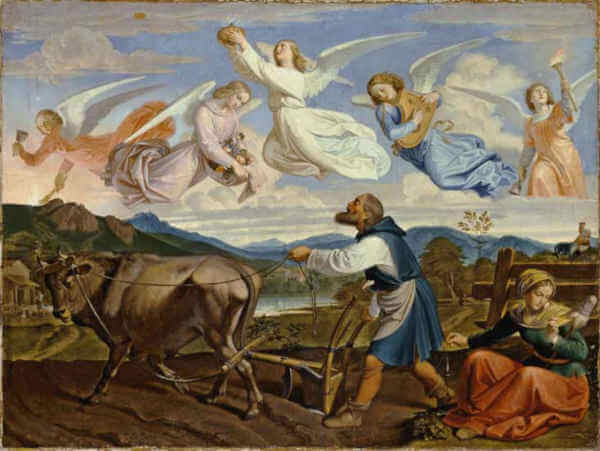 Saint Isidore the Farmer - My Catholic Life! It would be wonderful to see in a church a marble statue of a nurse taking a patient’s blood pressure. It would be edifying to see in a Basilica’s bright stained glass a housewife standing fatigued at the ironing board, running the iron over her kids’ shirts. And it would be marvelous to gaze in admiration at a well-executed painting of a factory worker pounding a piece of metal into shape with a hammer. Imagine if Catholic art presented these mundane scenes for contemplation in our churches, chapels, and shrines. Imagine kneeling before a bank of glowing candles and reflecting upon the everyday heroism of the lay vocation. We could light a small candle, step back, cross our hands, pause in silence, look at the layman in a suit at his desk in the mosaic before us, and whisper a prayer asking for his divine intercession to help us be a more charitable nurse, a more dedicated housewife, or a more honest worker. There is nothing in the mind that is not first in the senses. So our churches inspire us, ideally, with their statues, stained glass, paintings, mosaics, floors, and tapestries. The images of the holy men and women of our long Catholic tradition typically show popes, bishops, priests, nuns, abbots, monks, friars, brothers, missionaries, and others, dressed in their religious habit and armed with the symbols of their office and their life. All of this is good. All of this is necessary. All of this is inspiring. 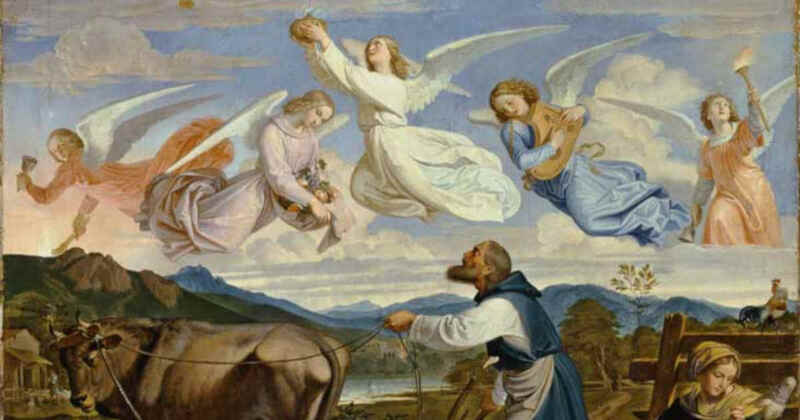 Yet today’s saint, Isidore, offers us a different pathway of holiness to consider—the broad and well-traveled pathway crowded with the Catholic laity on their way to work in the morning. Saint Isidore was from Spain and was named in honor of Saint Isidore of Seville, a scholar, bishop, and Father of the Church who lived in the sixth and seventh centuries. The two Isidores could not be more different. Today’s Saint Isidore is known in Spanish as “Labrador” or “the farm worker.” He was not a scholar and probably had trouble reading. He was not ordained to Holy Orders but married and a father. He surely had calluses on his hands, a red, leathery neck burned by the sun, and a sore and twisted back for most of his life. He earned what little he had. No one gave it to him. He did not put food on his family’s table by generating great thoughts or publishing profound books. And due to exhaustion he probably had no trouble sleeping at night. Numerous legends of miracle working and holiness attest to Saint Isidore’s influence on Spanish culture. In 1947 his partially incorrupt body was even put on public display to provoke prayers to bring a terrible Spanish drought to an end. Saint Isidore is the patron saint of Madrid and of numerous other towns, cities, and regions throughout the Iberian Peninsula and Latin America. Processions, Masses, fireworks, and public devotions render him homage on his feast day. Yet besides his dedication to working the land, few details of Saint Isidore’s life are known with certainty. Our religious faith cannot occupy only one sphere of our life, as if it were a hobby akin to building a ship in a bottle, flying a kite, or cultivating a garden. A real religion impacts everything. Even work. Especially work. We fulfill God’s will in our daily lives—which are packed full of work—by doing our work well. We should do our work diligently and at a high professional level, because it is an offering to God first and foremost. In other words, bad work equals a bad offering. Work is the practical use and expression of the skills God has loaned us for our earthly pilgrimage. To misuse those skills, to let them lie fallow, or to put them to ill use, is to bury a treasure in the ground. “Ora et Labora” is the Benedictine maxim. Prayer and Work. Yet work is prayer for the vast majority of the baptized. Saint Isidore’s life teaches us, indirectly, that God can convert an entire nation without ink or paper. A book might help, of course, but a religion of the Word is not the same as a religion of the Book, and Catholics are a people of the Word. Saint Isidore is the patron saint of farmers, day laborers, and brick layers. He is often shown wearing rough clothes, oxen leading him as he plows a furrow, with an angel at his side and a golden halo shining over him. A farmer saint. Why not? Saint Isidore, your witness of dedicated and holy work is a model for all who earn their bread by the sweat of their brow. May your quiet and humble dedication to your lay vocation inspire all the baptized to see in “work well done” a source of dignity through which man participates in God’s creative act.